Your boy the LG Santa, aka L.A.Y dash z, aka the only-one-driving-super-sleigh-with-9-four legged-homies, hits the stage for some dope Holiday season LG Optimus advertising. Yes, we’re not kidding - LG, the company with the smiley face, has just produced the next big thing in hip-hop in its attempt to market the glasses-free 3D-enabled LG Optimus 3D and the LG Optimus Black. To freshen up your mind, the LG Optimus 3D known as the LG Thrill 4G comes with a 4.3-inch display with a parallax barrier for glasses-free 3D. The LG Optimus Black on the other hand is a more traditional handset with a brighter than usual 700-nit screen. 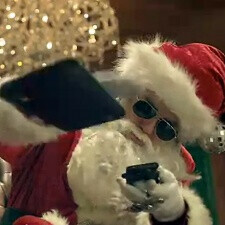 With this in mind, watch the Lay-Z Santa make it rain Optimus phones in this bizarre video below. Yes, this Christmas he aint gotta deliver himself but if it was up to you, what gadget would you put in the gift bag for your loved ones? will there be event coverage on this here or ANYWHERE?? For the event today I mean..